MTU North America recently announced the promotion of two employees—Jeb Berg to vice president customer services and John Shock to general sales manager— as part of a company reorganization implemented to improve customer service and the overall operation of the company. 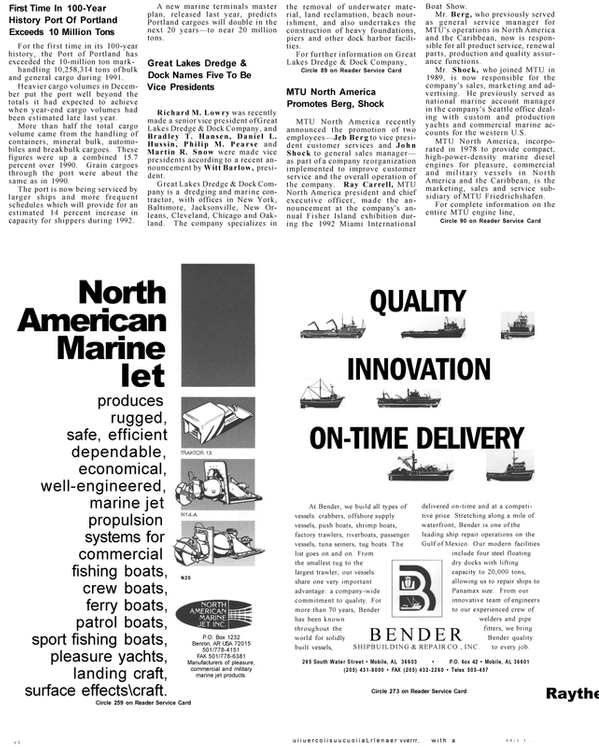 Ray Carrell, MTU North America president and chief executive officer, made the announcement at the company's annual Fisher Island exhibition during the 1992 Miami International Boat Show. Mr. Berg, who previously served as general service manager for MTU's operations in North America and the Caribbean, now is responsible for all product service, renewal parts, production and quality assurance functions. Mr. Shock, who joined MTU in 1989, is now responsible for the company's sales, marketing and advertising. He previously served as national marine account manager in the company's Seattle office dealing with custom and production yachts and commercial marine accounts for the western U.S.
MTU North America, incorporated in 1978 to provide compact, high-power-density marine diesel engines for pleasure, commercial and military vessels in North America and the Caribbean, is the marketing, sales and service subsidiary of MTU Friedrichshafen.